The Road 1815 Cattle Dip Vat (CDV) site is located on the toe slope of a large hill just outside the floodplain associated with the North Fork of the Illinois Bayou. The site is located within the Ozark National Forest and is on federally owned land. 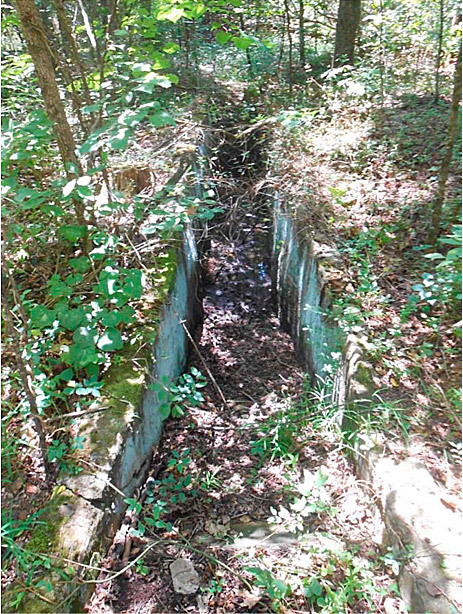 The concrete vat structure is approximately 31 feet long by 3.5 feet wide by 4 feet deep and is located adjacent to Forest Road 1815, between the road and Sherman Cemetery. Figure 11-4 shows the Road 1815 Dip Vat. Former CDV sites have been identified within Forest Service (FS) Southern Region’s National Forests, which are designated for recreational use and commercial logging. Typically, no fences are present to limit public access to the potentially contaminated former CDV sites. CDV sites within the Southern Region National Forests are generally similar in size and construction and may have been used from approximately 1900 to 1960 for the treatment of livestock. CDVs were typically concrete- or wood-lined basins constructed in pastures or cattle-loading areas that were filled with pesticides. Arsenic-based pesticide solutions were used in conjunction with dip vats and became well established as the preferred method for cattle treatment. Individual cattle were driven into the CDV, where they were immersed in the pesticide solution before exiting the basin at the opposite end onto a drip pad. The identified historical CDV sites are now abandoned and may pose human health and environmental risks due to residual concentrations of metals and pesticides potentially present in environmental media at the sites. In general, many of these CDV sites are similar in their setting, design and construction, types of chemicals used, and extent of contamination. Investigation of numerous CDV sites across the Southeast has frequently found arsenic in soils. The CDV Management Plan (CDVMP) was implemented to systematically assess the presence, extent, and potential risk posed by residual contamination at CDV sites within the FS Southern Region’s National Forests. Between 1906 and 1943, CDVs were constructed throughout the southern United States as part of the Cattle Fever Tick (Boophilus microplus and B. annulatus) Eradication Program. The program was aimed at the eradication of the tick responsible for transmitting the ‘Texas Fever’ disease (bovine babesiosis) among cattle herds. After a 36-year campaign, cattle fever ticks were declared eradicated from the United States in 1943; however, dipping reportedly persisted in some areas until the 1960s. Background concentration of arsenic in soil for the site was 13 mg/kg. Arsenic in surface soils was measured with both discrete samples and multi-increment samples (incremental sampling methodology). The data set consisted of 15 discrete surface soil samples, along with three 30-increment samples covering the exposure area, and three 30-increment samples covering the area within three feet of the vat structure. Discrete concentrations ranged from 18 to 715 mg/kg, with an average concentration of 332.4 mg/kg (95% UCL assuming lognormal distribution). The average concentration measured using incremental sampling methodology ranged from 276 to 321 mg/kg for the area near the vat and from 33 to 63 mg/kg for the overall exposure area (including the area near the vat). The soil type consisted of dark brown to medium brown sandy loam, with gravel and cobbles interspersed. Soil pH was 7. Iron content ranged between 30,000 and 40,000 mg/kg. The source of arsenic at the site was pre-1950 pesticide solution. The future land use scenario is recreational use. The Glycine pH 1.5 in vitro gastric bioaccessible arsenic method was used on the eight samples at a cost of $65 each, for a total cost of $520. A value of 15% relative bioavailability was used in the site investigation report when comparing average arsenic concentrations to site-specific risk screening levels (456 mg/kg for low-level threat waste and 4,560 mg/kg for primary threat waste). These screening levels were developed using USEPA’s SSL calculator’s recreational scenario assuming a 1-hour visit to the site every week every year along with the default RBA of 60%. The site-specific RBA of 15% derived through IVBA analysis and USEPA’s regression method mentioned above, offered a greater level of confidence to project managers when making site decisions. 11.2.5 How Did Bioavailability Results Affect Site Decisions? No further investigation or cleanup was necessary using the site-specific bioavailability results and site-specific exposure scenarios. While it is hard to quantify exact savings at the site, another similar CDV site that was cleaned up based on discrete sample concentrations compared to general screening levels without any consideration for bioavailability cost the government over $300,000. Based on this comparison, this new approach using site-specific risk screening levels, ISM-derived average contaminant concentrations, and bioavailability considerations has saved at least $200,000. This savings is significant savings, considering that over 100 additional CDV sites must be investigated on USDA FS managed lands. The USDA Forest Service investigated potential risks from arsenic in soils at the site using its authority to implement CERCLA under Executive Order 15280. No community involvement was necessary for this preliminary site investigation.